The Competent Communicator is the first public speaking certification offered by Toastmasters. When you become a member, you receive a book called Competent Communication, containing 10 speech projects, each outlining a speaking skill to practice via a prepared speech at a Toastmasters meeting. The goal of your first speech is to just get up there and kick off your speaking practice and benchmark your skills. To make the experience a little easier, the topic is something you know very well – yourself. This is a slightly shorter speech (4-6 minutes instead of the usual 5-7 minutes) and can be about anything related to you. Topics could include a holiday you went on, a turning point in life, influential mentors, and favourite hobbies. 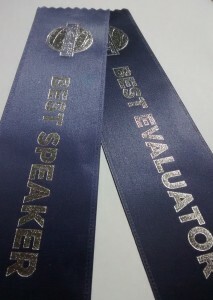 You could even talk about how you ended up in a Toastmasters meeting! For your second speech, you focus on the organization and clarity of outline. Make sure to include and practice an opening and conclusion, and have no more than three clear points in between. Your third speech should have a key message – state your key message early and use your material to provide supporting points, and reiterate your key message in your conclusion..
For this speech, you focus on the actual words and delivery of your speech, including word choice, sentence structure, and rhetorical devices. Typically speeches involve topics that lend themselves to evoking the senses (the smell and taste of food, or the colours and sounds of a big event). Now we turn to your body language during your speech – posture, stance, eye contact, facial expressions, gestures, and stagecraft. Next up, you practice varying your voice in terms of voice pitch, pace, and pauses. Vocal variety is a great way to keep your audience engaged in your speech. It’s a great chance to pick a topic you don’t already know, but that you are interested in. For this speech, you want to make sure to back up arguments with research and evidence and share that evidence to make your speech stronger. Now it’s time to get in the mind of your audience and learn how to deliver a powerful, persuasive message. You could use a debate, something topical or something you are particularly passionate about. For your 10th speech – the final speech of the Competent Communication certification – you pull together all the skills practiced in the first 9 speeches to deliver a killer presentation that inspires your audience. Make them think, be memorable for all the right reasons. Knocking that out of the park, in conjunction with the advanced leadership certification, will earn you status as Distinguished Toastmaster. This entry was posted in Blog and tagged Advanced Communication, body language, Competent Communication, Competent Communicator, Distinguished Toastmaster, gestures, ice breaker, Powerpoint, PPT, sentence structure, speech, toastmasters, voice pitch. Bookmark the permalink.